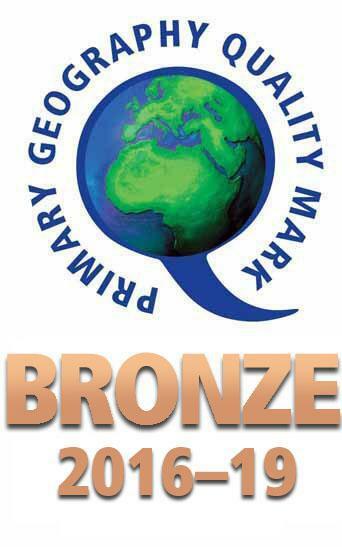 We are delighted to have been awarded the Primary Geography Quality Mark bronze level. This is a recognition of the development work done throughout the school in Geography, led by Mrs Tyzack, to ensure that there is 'lively and effective geographical learning in primary schools'. The award feedback commends our focus on wider world perspectives and the links we are making with other schools along with the importance of children understanding what geography means and Mrs Tyzack's enthusiasm for the subject, along with the enjoyable variety of geographical learning that is taking place. It also offers us some 'next steps' to focus on, such as making some geographical links clearer in our referencing and continuing to develop enquiry-based fieldwork, to continue to ensure that effective learning takes place in our school.